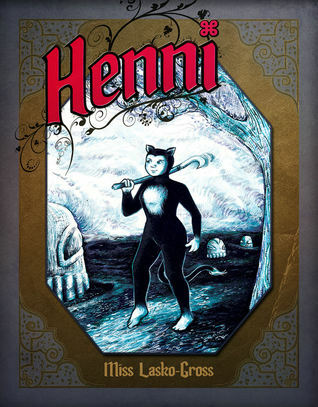 Henni is a girl who lives in a village dominated by their religion; people follow their religion blindly, those who voice their disagreement are severely punished. However, Henni is young and curious and questions this blind devotion. In her quest for answers, she ventures beyond the barrier [which is just a line in the sand really], those in her village believe that she has returned as a demon inhabiting her body. When she tries to reason with them, they shun her and as such she must flee. While out in the world, she is found by another group of "civilized" people, who are just as backwards as her people with their blind obedience. The story was unique and interesting, as it follows a character who questions her surroundings and attempts to further her understanding of her world and they way her stalled culture views everything. The art was appealing; however, my only issue with this book was the ending. I will not spoil the ending for you because that would just be terrible of me, but I do hope that there is a sequel, something that closes the story. Other than my issue with the ending, everything else was good; the portrayal of blind devotion to ones religion is captivating, because it portrays how societies can live in oppression to their faith.